An inflammation or infection of the outer ear canal (the passage leading from the external ear to the eardrum), ear canal infection, or otitis externa, is often associated with excess water in the ear canal. It frequently occurs in children and young adults who swim a great deal, and the common name for the inflammation is ‘swimmer’s ear’. Usually only one ear is affected, but in some cases the symptoms can persist for several months, which is known as chronic otitis externa. The symptoms of chronic otitis externa tend to be much milder. Repeated exposure to water can increase your risk of otitis externa, as water can clear earwax out of the external ear canal, making it very itchy. 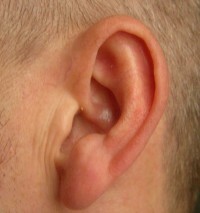 If you try to scratch inside your ear, the sensitive skin of the canal can break down, allowing an infection to take place. Water in the ear also creates a moist environment, which encourages bacteria to grow. Certain foods can make the body prone to ear infections, and other foods can ready the immune system to fight off infections, according to nutritional therapy. Food allergies may also be responsible for repeated ear infections, especially in young children. All common food allergens can be eliminated from the diet under the supervision of a trained professional. Eliminating heavy proteins and sugars is also recommended. Supplementation of vitamin C, vitamin A, and zinc may also be helpful in warding off infections. Vitamin C with bioflavonoids help to support the immune system and fight ear infections. Try one teaspoon of vitamin C crystals or powder to six ounces of water. Take 1⁄2 to one ounce of this mixture every one to three hours. Reduce the dosage if it causes a stomach ache or loose stools. Zinc can be very helpful when fighting acute ear infections. Zinc lozenges quicken the immune response and aid in reducing an ear infection. Beta-carotene and vitamin E with mixed tocopherols promotes healing of the mucous membranes.